Unseasonably cold temperature and winds up to 15 knots welcomed the high-flying International Moth fleet to Narragansett Bay on Saturday for the inaugural 11th Hour Cup regatta, with long time Newport local and reigning US National Champion Anthony Kotoun sailing a nearly flawless day to lead the fleet. Sunday’s forecast offers light to moderate breeze, which is likely to favor the lighter sailors like Knowles and fleet newcomer and M.I.T. graduate student Brooks Reed, while Kotoun will fight to hold on to his lead. 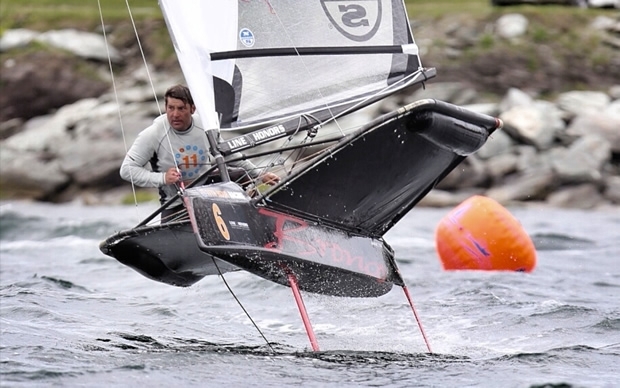 Southern California’s Zack Maxam will likely be back on form after a distracted day on Saturday, when he ended racing early to propose to longtime girlfriend and Moth fan Christy Politowski at the water’s edge near Fort Adams. “She said ‘yes’, and that’s better than winning any race,” Maxam said. Relive Saturday’s racing with photos, videos, and interviews on the US Moth Class Facebook Page, and tune in Sunday at 11 AM for racing. Photos and videos of the racing can be found in the gallery here.